For teachers who have the blessing of sharing God’s Word with their students, Arch® Books are a must-have for the classroom or school library. This series readily supplements lesson time or story hour, but these books go beyond use as read-alouds! Work as a class or in small groups to retell the story using original words, writing your version at the bottom of the poster board pages. To brainstorm, review the Bible account by rereading the Arch Book to your class or speaking the words straight from Scripture. Display your new story on a bulletin board for all to see! *For younger students, the pictures on poster board become a “puzzle” that they can put in story order. **Arch Book illustrations are to be used for this classroom activity only. You may not use these illustrations for any other purpose. Nothing brightens the day of nursing home residents, hospital patients, or other similar groups like the smiling faces of children. Prepare a dramatic performance of an enjoyable Arch Book and ask a group in your community for permission to share. Lower elementary students can memorize short lines from the story and show character emotion in facial expressions, gestures, and basic line recitation while the teacher narrates. For upper elementary, children can direct and deliver a mini play under the teacher’s supervision. Use the metrical index in the back of a church hymnal (Pg. 1007 in the Lutheran Service Book) to find tunes that will work for your Arch Book music. 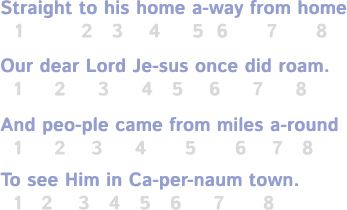 The above stanza can be sung to the tune Duke Street, or "I Know that My Redeemer Lives." Your class will love turning favorite stories into songs! 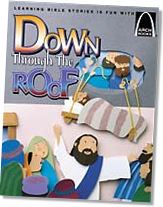 Reading an Arch Book can inspire young authors and artists to write and illustrate their own rhyming Bible books. Select a story from Scripture and let your class draw what they hear. Then, have each student retell the story in his or her own really simple rhyme written on the bottom of each paper. The final products can be in print or digital form! You can bind the books using staples, yarn, or other materials of choice. Make digital books by taking pictures of your students' work with your camera or phone and place them in a PowerPoint or other movie-making program. Arch Book Resource Guides provide go-to handbooks for how to easily pair Arch Book stories with specific religion lessons. Although designed with One in Christ curriculum users in mind, each guide’s charts feature Bible story to Arch Book pairings that offer great tips for anyone, no matter what religion curriculum is used. Individual guides are available for Preschool–Grade 3 under the “Additional Helps” category on our One in Christ website. Does your school participate in the Accelerated Reader program? Arch Books on many different topics are available in the highly-acclaimed Accelerated Reader program. Above all, Arch Books strengthen Biblical literacy. But children in grade three and above can sharpen reading skills and comprehension through the series’ fun rhymes and thought-provoking themes. Visit Accelerated Reader’s website to learn more about the program’s Arch Book options.